Secondary School Substitute Teacher of Irish required immediately. Find more information about the school here. (Gaeilge) Cláraigh anois le freastal ar an dTionól Forbartha! 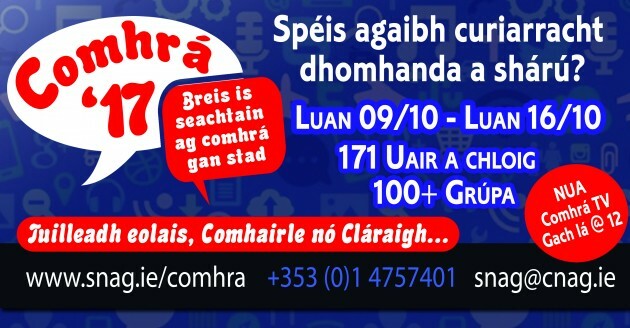 This world record attempt was started by Conradh na Gaeilge for the first time in 2013 with Comhrá 247, when they managed to reach 169 hours of non stop chat as Gaeilge, a world record! The attempt at 170 hours in 2015 was unsuccesful but a huge effort by community groups across the world in 2016 saw it broken once again. Groups from Europe, Asia, North and South America and Australia participated in the online conversation as part of #Comhrá16 organised by the Conradh, which was streamed live for the 17o hours on snag.ie. Bíonn idir ghrúpaí Gaeilge agus Gaeltachta, chumainn Ghaelacha tríú leibhéal, scoileanna, chlubanna CLG, chiorcail chomhrá Is Leor Beirt, stáisiúin raidió, institiúidí oideachais, craobhacha Chonradh na Gaeilge, agus go leor grúpaí pobail eile ar fud na cruinne ag déanamh a gcuid cainte ar son na curiarrachta seo. Úsáidtear Google Hangouts le comhrá leanúnach a cruthú agus is iontach an deis í buaileadh le daoine le Gaeilge fud fad an domhain! This year we’re planning on breaking yet another record with Comhrá 17. We welcome all groups, individuals and scoileanna to join us this year – coimeád súil on our social media pages to find out when you can register – and be quick, it fills up fast! Job Vacancy – Naíonra Cholmcille, Co. Dublin.